With UK property prices hitting an all-time high this year, the business of owning a home has never been so bank account-busting. Whether you’re scrimping to save for a deposit, cutting down on expense because you’ve just coughed up for one or stuck renting for a few years until something (or someone) gives, it doesn’t make sense to splurge additional cash on raising your home’s style quotient. But there are ways of pimping your pad without putting yourself in the red. Here, we give you the expert tips for making the most of your home without defaulting on your mortgage. Some shelving units can even double as walls. (Of sorts.) “Half-open, half-closed bookcases can be used to segregate spaces without the use of partitions or walls,” says Pamela D’Alessandro, designer at interior design consultancy JAC Group. Beats getting the builders in. “Lighting is one of the most effective ways to upgrade your space,” says Long. If you can’t justify sinking piles of cash into overhauling what’s in your room, then change the room itself – all you need is lick of paint. Create a feature or accent wall by painting one of the room’s walls a colour that contrasts with the others. “This will create a visual anchor within the space while also simultaneously adding an injection of colour,” says D’Alessandro. 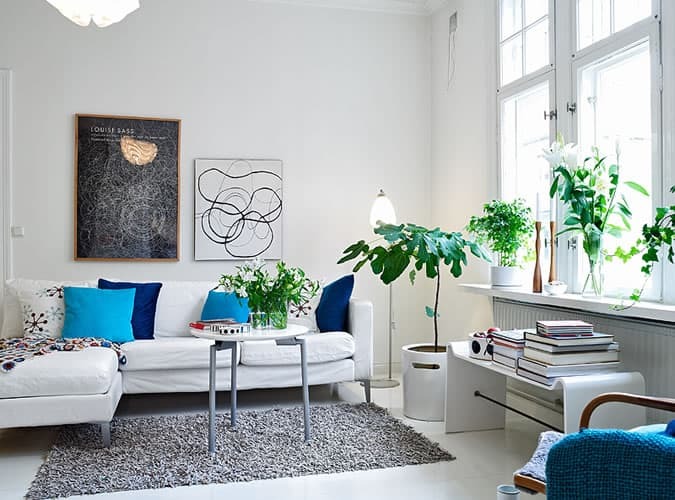 Or, if a contrast colour’s too punchy for your tastes, hang an eye-grabbing piece of art on your feature wall instead. “One of the easiest and cheapest ways to upgrade your room is to invest in a rug to layer on top of your existing carpet or floorboards,” says Long. “There are all sorts of styles out there but flatweave rugs are the cheapest option to add instant colour and can immediately refresh a tired looking space. Alternatively, for kitchens, bathrooms or other spaces covered in vinyl, you can mask the material’s inherent ugliness by painting it a new colour or in a striped/checked pattern. Bang! The 1970’s vibes are gone. Since trading in your bog-standard IKEA sofa for something better-made might take a few months’ of saving, it’s worth learning the instant fixes for overhauling your furniture – like cushions and throws. “The great thing about cushions [and throws] is the fact that they are such strong visual statements in a room but they are so easy to change and, most importantly, cheap,” says Long. Arguably the best way to add ‘life’ to a room is to do exactly that – and no, we don’t mean adopting a litter of pugs or turning your flat into a cattery, but decorating your space with plants instead. D’Alessandro recommends succulents and air plants which are low-maintenance but packed full of colour and can be placed on coffee tables, shelves or hung on metal or wooden plant frames. Just try not to kill them this time. Only the luckiest guests get to see your bedroom but most will, at some point during their visit, need to answer nature’s call. It’s the little things that elevate your bathroom above bog-standard – like switching cheap handtowels out for quality supima cotton ones, or storing handwash in a soap dispenser rather than the bulk-bought Carex bottle it came in. A scent diffuser also comes recommended. For obvious reasons. Otherwise known as the interior designer’s secret weapon, a well-placed mirror has myriad benefits other than reflecting your natural beauty. You can place one behind a light source – like a lamp or hanging pendant light – and it’ll maximise the light’s reach, helping to ‘beam’ it throughout the room. You can hang one on the wall of a box room to add the illusion of space. You can even use a smaller mirror to cover up an eyesore you can’t otherwise get rid of – like a thermostat or home alarm system. There’s a difference between eclectic and channelling Hoarders: Buried Alive, so keep your rooms free of stuff that doesn’t need to be there, and contain unsightly extraneous bits like TV and speaker wires with cable clips where possible. FIXA 114-piece cable management set, available at IKEA, priced £3.50. Will you be deploying any of these home hacks? Any of your own you care to share?